COLOMBO, Sri Lanka (CNN) -- The deafening roar of drums and horns rose as thousands of people took to the streets in Sri Lanka Friday for a victory parade marking the end of the decades-long civil war. 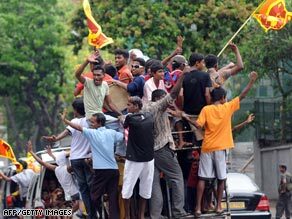 Sri Lankan youth celebrate on the street in Colombo on May 20, 2009. Sri Lanka's government declared victory Tuesday in the country's 25-year civil war against the Tamil Tiger rebels. The announcement brought celebrations to some parts of the country. President Mahinda Rajapaksa announced that Tamil Tiger leader Velupillai Prabhakaran had been killed and local media released footage of the fallen leader's body. "The process of national reconciliation we feel must be all inclusive so that in can fully address the legitimate aspirations of the Tamil as well as other minorities. It is important that the victory becomes a victory for all Sri Lankans," said Vijay Nambiar, a U.N. special envoy. U.N. Secretary-General Ban Ki-moon is expected to visit the area this week.